If special seating is to help a child sit well, gain better head and body control, or move and do things more easily, it is essential that the design be appropriate for the child's needs, and that it fit the child correctly. 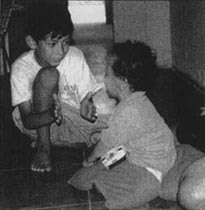 In many parts of the world, one sees disabled children sitting in specially-made seats or wheelchairs that simply do not fit them. Often the seat is far too big. Before building a seat for a child, it is important to take correct measurements. Equally important is to carefully evaluate the child's individual needs, interests, limitations, abilities and possibilities, as well as her likes, dislikes, and fears. The most important test of a special seat is: Does the child like it? Even a child who is mentally delayed or cannot express her wishes with words may have strong feelings about how she is treated or seated. I (the author) have seen occasions where a beautifully built, accurately fitted seat is painstakingly made for a child. Yet the child screams every time she is put in the seat, and despite repeated attempts and coaxing, she never learns to accept it. (For an example, see page 66.) Sometimes the child may have good reasons (see the special seat made for a child with hydrocephalus, page 293). Such a seat can perhaps be modified or rebuilt so that it is more acceptable. But clearly, it is preferable to make a seat that from the first comes close to meeting the child's needs. One of the best ways to find out what type and size of seating may best meet a child's needs and preferences is to experiment with a variety of different pre-existing seats. The solid straight lines show the measurements that are usually needed to build a seat that is the right size for a child. For this reason, PROJIMO likes to keep on hand a collection of special seats of different types and sizes. 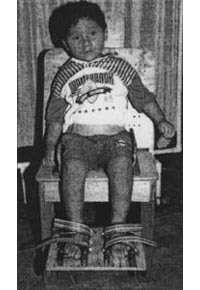 Often a seat that does not quite fit a child can be provisionally adjusted by putting a block over the footrest or a thick pad against the backrest. If the angle (tilt) of the seat needs to be changed, try putting one or two books under the front or back of the seat, according to the child's particular needs. 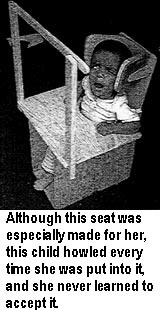 Such experimentation, by trial and error, is important before actually designing and building seat for an individual child. Building an appropriate seat for a child who has a lot of spasticity or deformities often involves much more than simply taking accurate measurements of the child. Trials with different seating possibilities can be very helpful. But a pre-existing seat that both fits the child and has the combination of features and positions the child needs is often not available. PROJIMO has experimented with the design and construction of a completely adjustable "fitting-and-measuring seat," in which a child of any size can be tested in a range of positions. Such a seat needs to have independent adjustments - for width, depth, height, and for the angle of the seat, the foot-rest, the back, and the head-rest (when needed). It must also have adjustable, removable supports for positioning and alignment of the hips, back, shoulders, and head. And it should have a removable table with adjustable height, angle, hand holds, and other features. Fortunately, a physical therapist, Jean Anne Zollars, was making visits to PROJIMO to help teach short courses on special seating. 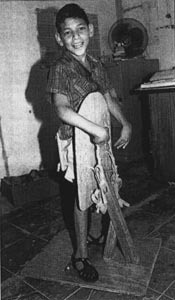 She helped to design and build the early experimental special seats. Note: Adjustable sides of the seat, and wedges for sideways stability of the hips, body, and legs are not shown in this sketch, yet will be needed for some children. Headrest: moves up, down, forward, back. Headrest or its sides are removable. Backrest: angle and height are adjustable. Seat: depth and angle adjustable. Blocks: under front and back of base-board, to tilt the entire seat. Foot-rest (and seat height): adjustable. Cross-bar for feet or ankles: adjustable. 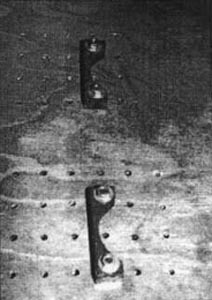 Leg separator (pommel): adjustable width, removable. Table: adjustable height and angle. 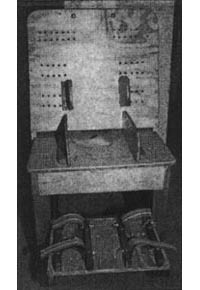 These drawings show how the early, experimental measuring seat could be adjusted to test a child with the seat tilted both back and forward (see p.47). 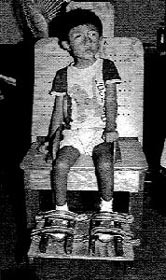 The first experimental measuring seats designed and built at PROJIMO could be modified for children of many sizes and needs. But they were too complicated, too big, and too difficult to adjust. Eventually, the team made simpler designs that were easier to adjust. These include the adjustable seat-with-wheels shown on the next page. To provide special support for persons who need it, wedges of different sizes and shapes can be made. 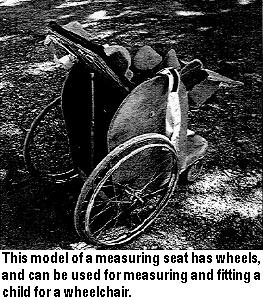 For the adjustable wheelchair shown here, the team molded wedges made of sawdust mixed with white glue. 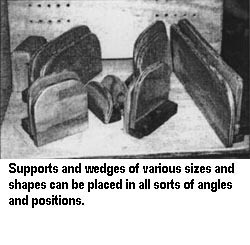 Wedges can also be made of paper maché or layers of corrugated cardboard (see page 73). Some of these measuring seat designs were developed during a series of short courses at PROJIMO by participants from community rehabilitation programs in different Latin American countries. One participant in the course was Monica Rook, an occupational therapist from Holland who was helping to facilitate a CBR program in Belize. 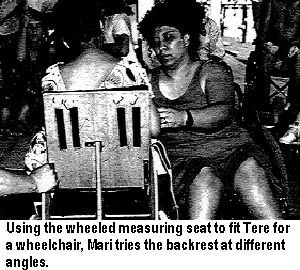 After returning to Belize, Monica and her team designed a simpler, easier-to-build measuring seat, details of which are shown on the following page. It is exciting when course participants improve on innovations in their own programs and countries. The adjustable chair from Belize is made of wood. Wooden support pieces of various sizes and shapes are attached to the seat and back of the chair. These can be positioned, adjusted, or removed depending on the child's needs. The supports - which can be used to stabilize the feet, hips, trunk, shoulders, and head - are attached by bolts. These fit through rows of small holes drilled in the footrest, seat board, and back board. The seat belt and foot straps are also adjustable. 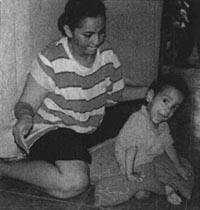 Using a similar technology with adjustable pieces of wood, Monica Rook and her team of community rehabilitation workers in Belize also invented a device for fitting and measuring children who need a custom-made standing frame. 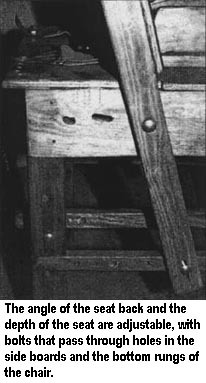 The feet are held in position by wooden heel-stops which can be adjusted with bolts that pass through the floor board. The standing board is hinged, and the angle (tilt) can be easily adjusted. "Special seating" can sometimes be quite simple. 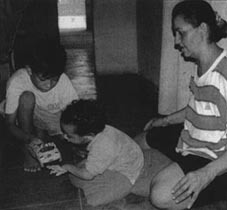 Here the mother of CRUZ, who has cerebral palsy, helps her son sit upright by placing sand-bags across his folded legs and behind his hips. 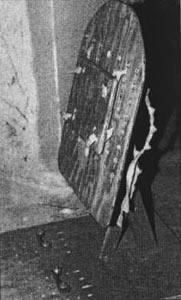 Later, PROJIMO created a cardboard seat for Cruz (see Chapter 8).